BERT van Marwijk may have initially kept all of his available Honduras heroes but when it came to the crunch he wasn't scared to make changes. Japan-based keeper Mitch Langerak and France-based left-back Alex Gersbach are the two players who would be most dismayed with Ange Postecoglou's departure right now, omitted from the original 29-man squad along with Hibernian striker Jamie Maclaren, who'll feel stiff to miss out after scoring at the weekend. The duo would've made Ange Postecoglou's squad - Langerak, who's started the season strongly with Nagoya Grampus, was a rated highly as a shot stopper who was thrown in as No.1 as recently as March 2017 while Gersbach's Confederations Cup display virtually booked him a Russia 2018 spot previously. 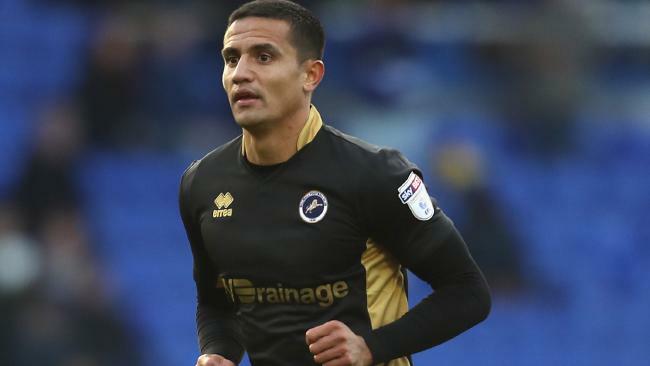 Feyenoord keeper Brad Jones and Millwall left-back James Meredith are the two mature-age beneficiaries, recalled after lengthy absences. Van Marwijk has admired Jones' revival first-hand at his former club and he will compete with Belgian-based Danny Vukovic for at least a 45-minute cameo in either Oslo or London. But looking ahead to Russia, it would be a big call displacing Mat Ryan as No.1 in a season he's broken into the Premier League, with his stunning penalty save off Wayne Rooney on Sunday almost sending a statement to the new Socceroos boss. There is not quite the Ange Postecoglou overhaul from four years ago, when he drafted in a host of untried talent from the fringes including Mathew Leckie, Ivan Franjic, Tom Rogic, Jason Davidson and Ryan. 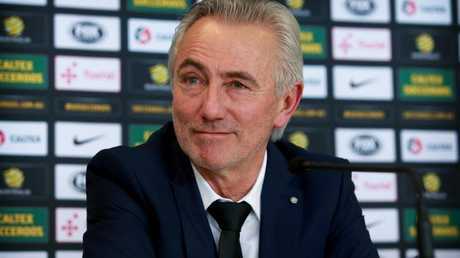 But there's enough changes to add an extra layer of intrigue and to indicate that van Marwijk will want to put his own imprint on the team. Dimi Petratos and Andrew Nabbout clearly made an impression on van Marwijk when he watched the Jets' 2-0 win over Victory a month ago, as did Josh Brillante pulling strings deep in Sydney FC's midfield. Van Marwijk will most likely play a 4-2-3-1 or a slight variation, with Nabbout - who since signed for Urawa Red Diamonds in Japan - adding pace while Petratos provides another attacking midfield and dead ball option. Brillante will be hard-pressed displacing captain Mile Jedinak, experienced Mark Milligan or QPR star Massimo Luongo from midfield despite offering something different but he may even get a chance to stake his right-back claims with Western Sydney's Josh Risdon the only other recognised right-sided option assuming van Marwijk ditches Postecoglou's back three for a back four. Trent Sainsbury was picked despite not playing yet for Grasshopper Zurich, enabling the Socceroos' medical staff to screen him. That opens the door for Czech-based left-footed stopper Alex Susnjar to stake a claim with Korea-based Matt Jurman lacking match fitness.